This is a poll result I would hardly have expected from the Jerusalem Post of all papers. Should Israel trade prisoners for Gilad Shalit? One cannot blame the parents, relatives and friends for trading anything for their loved one. Least of all jihadist garbage that has no value to anyone, but must be quarantined for our safety. But what do these 25,000 Israelis expect life will be like, when Hamas is shown that with more kidnappings in the future they will be able to free ALL their compatriots? It is the exact opposite of the message that needs to be conveyed to Hamas and their ilk. We will stay in Gaza … we won’t stay in Gaza. Hamas should do this … Abbas must do that. Peres says this, Ramon says that. Yap yap yap … there is no shortage of talking heads from all branches of the government pontificating over the abduction and killing of our people. Personally I have had a bellyful of what the politicians have had to offer. Like disengagement and the senseless eviction of thousands of Jewish families most of which still languish in temporary shelters still waiting to receive a penny in compensation. Like the relaxing of border restraints and confidence-building measures for Abbas, which have been exploited for the importation of ever greater quantities of arms which will be ranged against our troops in the days ahead. And let’s not forget our own shipments of thousands of assault rifles to bolster Mr Abbas’s security. Then there was the wholesale release of hundreds of terrorists, each one of which our soldiers will have risked their lives to capture. And allowing a 6-times lifer like Barghouti – who should be rotting in solitary - enough freedom to run a political campaign from his jail cell. Like showing what a pluralistic liberal democracy we are by allowing Hamas to campaign for office in our own territory and appointing an Arab MK to sit on the Defense and Foreign Relations committee. What utter farce! And for all of this, what have we got in return? Less than zero means going backwards. Our people used to be able to walk the streets without fear of missiles falling out of the sky. Parents used to have a reasonable expectation that their kids could roam freely in their country without fear of being kidnapped and torn to shreds by hate-crazed Islamic fanatics. These are the wages of appeasement and the price of living in denial. Denial of the plain fact that these people have one single aim. To kill as many Jews as they possibly can and to terrorise the rest into fleeing Israel. That has always been their aim. Nothing less than total erasure of the Jewish state. That is why Arafat turned down even Barak’s giveaway offer at Camp David. You cannot keep throwing meat to a lion and expect it to turn into a vegetarian. So let it stop right here. Let the politicians finally shut up and let the army do what it knows best. To bring back their boy – hopefully alive – and flatten the terror infrastructure along the way. And to consign Hamas leaders Meshaal and Haniyeh to their heavenly virgins in the same bloodied state as Yassin and Rantisi before them. That is the only message our ‘peace partners’ have ever understood. 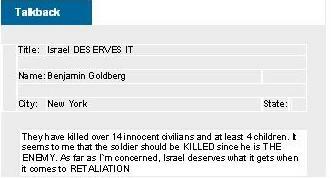 This is a feedback note which appears on the Haaretz news website. What kind of Jew writes this way about his own people? Talkback is an apt title. Jews like this - and the NYT's own Jewish publishers - will talk us all back to a second holocaust. "Officials from the office of the Defense Minister, Amir Peretz, denied that the kidnapping of Corporal Gilad Shalit would delay the expected destruction of several outposts in Judea and Samaria. " This poor 19 year-old soldier of Israel spends his second night in terror at the hands of murderous Arab abductors who have already killed two of his comrades. That they succeeded in their surprise attack - through a tunnel under the new Gaza border- is the result of Olmert’s failure to heed the advice of his own military chiefs on issues of border security. And for what? For a few brownie points with the West which – if they have any value at all – only last as long as our next act of national self-defence. Early reports suggest that the OC southern command hesitated in ordering a hot pursuit operation behind enemy lines for fear of breaking Olmert’s strict ground rules for not compromising Mr Abbas. It is high time that the IDF was allowed to do its job the way it knows best. Ours is a moral and trustworthy army which can be relied upon to do the right thing. Sadly, in Olmert’s case, such a question may have precious little impact. Neither of his sons has ever served in the Israeli army. It's not yet the end of June. But so far this month, no less than 176 Kassam missiles have been launched into Israel. By any normal standards, one tenth of such conduct would be defined as an act of war. 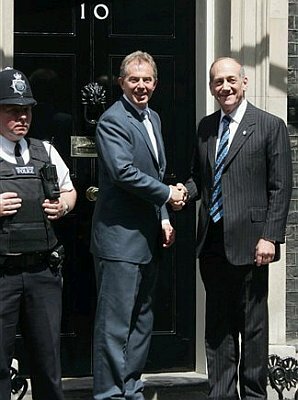 Bush and Blair instinctively knew when they were at war. But not our Olmert. What needs to happen for Kadima to accept reality? Are they waiting for a direct hit on a kindergarten in Sderot? War means going into enemy territory and wiping out the threat. The Army needs to re-occupy Gaza up to a depth that matches the current range of the PA's Kassam missiles. Each time the terrorists increase their range, we must increase the depth of re-occupation. Every step forward in killing technology must cost our 'peace partners' another few dunams of territory. That is the surest way of stopping the Kassam onslaught. Most would think that a prime minister's first obligation is the protection of the citizens in his care. Not so Ehud Olmert who continues to put politics and self image above all other considerations. As residents of Sderot go on hunger strike to protest the lack of military response to the barrage of Kassam missiles from liberated Gaza, Sderot's own first citizen, Amir Peretz is prevented from acting in his new role of defence minister of the State of Israel. "Make sure there are no embarrassments while I am away..." is the obvious parting message Olmert gave to Peretz prior to his Sunday departure for meetings with Blair and Chirac. The only other explanation is that Olmert is bowing to pressure from his own daughter Dana who last week demonstrated against Israel's brutality to Palestinians. I just wanted to say how horrified I am at the thought that your government is proposing to allow the Iranian leader a platform in Nuremberg. Most of my family were murdered by the Nazis. No amount of monuments, wreath layings or war reparations will compensate for your Chancellor's failure - at this critical moment - to send the message that now needs to ring out loud and clear from the Bundestag. Holocaust-deniers, bigots and anti-Semites are not welcome in the new Germany, now or at any time.